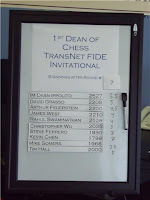 Here are the games from round one of the DOCA TransNet FIDE Invitational. 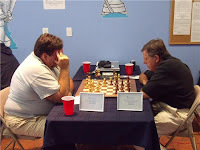 Blogger Bruce Till of Fearless Chess has posted his victory against me, at Chess.com where he uses the handle "spassky." 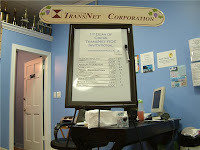 The game took place in 1996 at the New Jersey Open. 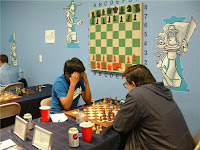 Next Monday is Chess Night at the minor league baseball game of the Lakewood BlueClaws. 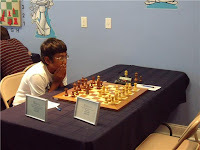 The pre-game festivities will include a simul by WGM Jennifer Shahade. 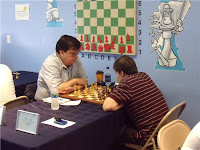 On Sunday, I snapped these photos during the Viking 4-County Open in Mount Arlington. 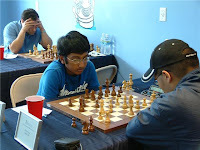 Most of the 24 players can be seen here, as the event begins. 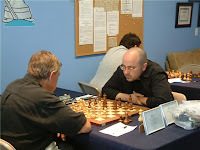 FM Steve Stoyko defeated James Luxich, in round one. 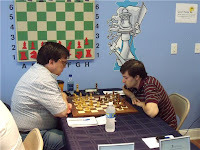 In round four, it was Louis Sturniolo who won against Luxich. 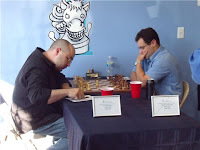 In the same round, Paul Joseph and William Dubinsky played to a draw. 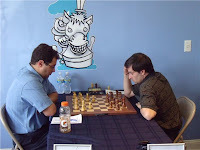 Meanwhile Stoyko bested Atlantic Chess News editor Steve Ferrero. 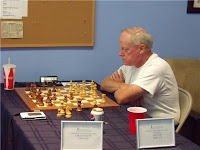 The tournament director was Ken Thomas. 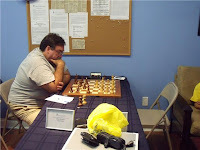 Yesterday I played at the Viking 4-County Open in Mount Arlington. The tournament ended in a three-way tie. 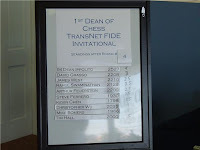 I was awarded the first place trophy on tie breaks over FM Steve Stoyko and NM Mark Kernighan. All of us had identical scores of 3-0-1. Here is my drawn game. 48.Kg4 Kf6 49.Kh4 Kg7 50.Kg4 Kf6 51.Kh3 Kg5 52.Nd2 Ba5 53.Nc4 Bc7 54.Kg2 Kh4 55.Nd2 Ba5 56.Nc4 Bc7 57.h3 Kg5 58.Kf2 Kh4 59.Kg2 Kg5 60.Kf2 Kh4 61.Kg2, draw. 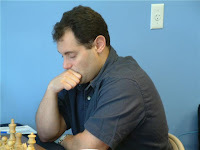 At 7:30pm, on Tuesday July 28th, senior life master Taghian Taghian will lecture at the Marshall Chess Club, in a series based on The Mammoth Book of the World's Greatest Chess Games. 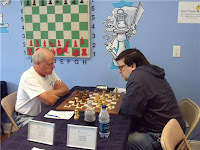 The two games being analyzed are Saemisch vs. Nimzowitsch, Copenhagen 1923 and Gruenfeld vs. Alekhine, Karlsbad 1923. Taghian has been teaching adults and children for the last twenty years with a clear and precise style that has made him one of the most sought after teachers in New York City. 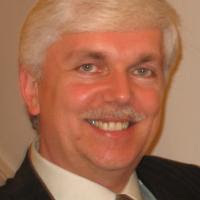 His previous lecture on July 14th was a great success. 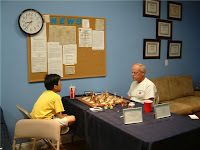 The lectures are free to adult players who are members, with a $10 fee to non-members. 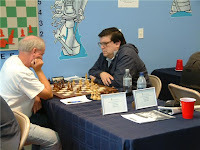 Steve Ferrero, editor of Atlantic Chess News, took these twelve photos last weekend at the DOCA TransNet FIDE Invitational. 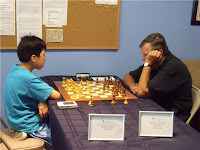 Chen - West @ "Contre Gambit Philidor"
Frederic Fournier has entered a recent post at Contre Gambit Philidor on my game against Kevin Chen. 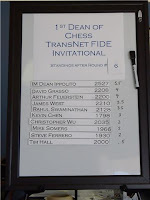 These are photos that I snapped during the final weekend of the DOCA TransNet FIDE Invitational. 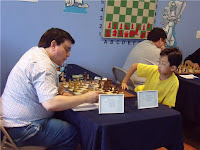 In his heyday, NM Arthur Feuerstein drew three games against the legendary Bobby Fischer. 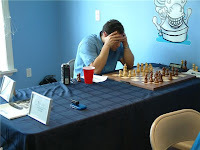 Tim Hall never seemed to recover from the winning position that he let slip away against NM David Grasso. 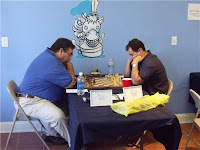 NM David Grasso handed IM Dean Ippolito his only defeat. 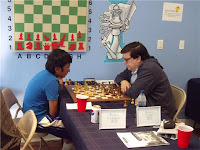 Not only did Christopher Wu beat Tim Hall, he defeated me as well. 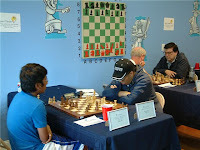 Kevin Chen and Mike Somers played to a draw. 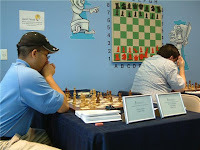 The tournament director was Aaron Kiedes. At the end of the event, Dean and Dawn Ippolito applauded the prize winners. 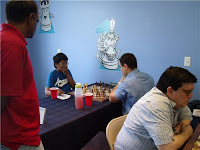 The New Jersey Futurity International 2009 was held from July 7th to July 11th, at the Dean of Chess Academy in Branchburg. 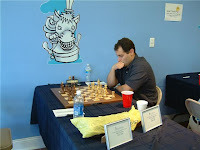 The U.S. participants were grandmasters Joel Benjamin and Jesse Kraai, international master Dean Ippolito, and FIDE master Evan Ju. 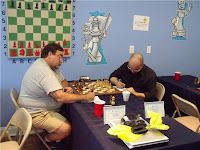 The field was rounded out by grandmaster Leonid Yudasin of Israel and international master Milos Scekic of Serbia. 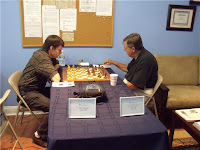 While playing at the DOCA TransNet FIDE International, I learned that the New Jersey Futurity International 2009 was won by GM Jesse Kraai. 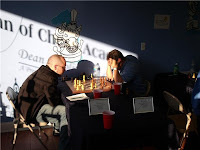 On July 11th, I took the above picture of organizer Michael Khodarkovsky and tournament director Glenn Petersen, outside the Dean of Chess Academy. 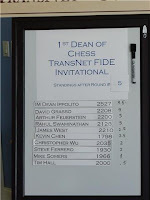 These excellent photos were taken by Kevin Chen during the final weekend of the DOCA TransNet FIDE Invitational. 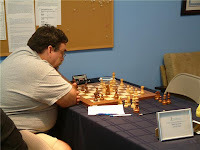 The shot of NM David Grasso playing against IM Dean Ippolito, while the sunlight streams in, is exceptional!